Apologies for delay in getting this out but I am still recovering – although almost there – from heat stroke during Sunday’s race. This is a copy of the race report I sent to my coach Ken Bryson, to whom I am grateful for his coaching, advice, experience and knowledge. I will update with a more ‘newsy’ post once I feel 100%. Thank you to everyone who supported me through Sunday’s race. As my first event at half ironman distance I had a lot of apprehension leading up to the race, however on race morning I was pretty calm. My bike was racked from night before so I set out my transition area, with a couple of new additions for me – a gallon bottle of water and a large bottle of gatorade. I attached 3 gels to my bike, opened an energy bar and placed it in my shoe ready to pull out and put in back pocket for the bike, and left a banana there too. It was a mile walk to the swim start so after vacating transition by 6.45am, I took my time and then walked to the start in a pair of socks that I could just ditch when I got there. Wetsuit on, I was wave number 15 so I got into the water beside the start and got used to the water temp – it was perfect! Once into the corral ready to go I still was quite calm – almost too calm I thought – but nevertheless as the gun went off we ran down into the water to begin the 1.2mile swim. Usually this is the part I fail at miserably but I really enjoyed the swim here – the buoys were easy to follow, the water was calm and I was always with people, able to draft or pass as necessary. In 31:50 I had completed the swim and was running up the beach towards transition. In transition I was fast, methodical and calm. I took time to make sure I picked up the bar and had a quick drink of the gatorade. Onto the bike course I was able to advance through the other athletes comfortably. The course itself was relatively flat with some ‘rolling’ hills, however the road surface was less welcoming. I don’t know why the roads are like this here but especially in residential areas there is often a break in the tarmac around every 5-10metres – and some bigger than others. As I had cycled 6miles of the course the day before I knew what to expect and had ensured all bolts/screws on bike were tightened! However, the straw in my aero bottle would inch up every ‘dunt’ I cycled over. About 5miles in I caught up to and passed a girl in a purple top. She then passed me a mile ahead and I passed her again. This ‘yo-yo-ing’ continued for a good 10miles but after cycling so close together I accepted that we were about the same speed and not wanting to get accused of drafting I sat back and kept her in my sights. This worked initially but then as we were overtaking people I lost her up ahead and with that my concentration went. For about 5-10miles I peddled comfortably, until I realised what I was doing and reminded myself that I was in a RACE!!! With the foot back on the gas I began to overtake again but this time with more drive and determination. I think I must have taken on at least 3litres of water on the bike course overall. 750ml of that was mixed with electrolyte tab but I was soon to find out that that was not enough. After shaking off a couple drafters, I passed the 50mile marker feeling strong! With 0.5miles to go, I undid my bike shoes, placed my feet on top of the shoes and got ready for T2. In T2 I poured some of that water over my head and took a second to wipe the sweat off my face. Unfortunately I was later to find out that that also wiped off whatever sunscreen I had left on my face! I took a bite of the banana and another sip of gatorade and headed out with gel bottle in hand. On exiting transition a volunteer slapped some sunscreen on my shoulders – a little too late I feared but no harm! My legs were jelly but I soon got into a steady rhythm. However it was HOT! I was starting to feel the effects of the heat and so made sure to take on water, cola, ice chips and an orange quarter at each water station. The people of Racine were out in their gardens, and most of them with hoses, hosing people down as they passed! Amazing support on the run course!! Unfortunately though, I was starting to develop heat stroke. I tried to cool myself down at each station, but was burning inside. Then I got the shivers and goosebumps. Getting the chills when you are super hot is not a good sign. I was also starting to become disoriented and struggling to keep any sort of focus. By this point, all I wanted to do was finish. When I turned at the half way point I knew I wasn’t going to be anywhere close to my goal run time of 1:30 but I really was getting into a desperate sort of shape. Trying to focus the race just become a ‘one foot in front of the other’ affair. The second lap seemed a lot longer than the first but eventually I came closer to the finish. Hearing the commentator and then finally seeing that finish line. I was able to pick up the pace for the last 200m- I always wonder where that final burst comes from – and crossed the finish line in 5:01:50. After I crossed the line I could no longer hold myself up. I felt like I had a ton of weight on my chest and couldn’t feel my hands or feet. I was taken to the medical tent where they worked to cool me down and fed me gatorade and cola. Luckily I didn’t have to be put on an IV although I think that might have been a quicker way to hydrate! After 45mins of lying covered in Ice and being sprayed down I was starting to feel a little better. After a stint of sitting up and losing circulation to my hands and feet again, I lay for another 15mins or so, and then exited the tent after thanking the nursing/medical staff. 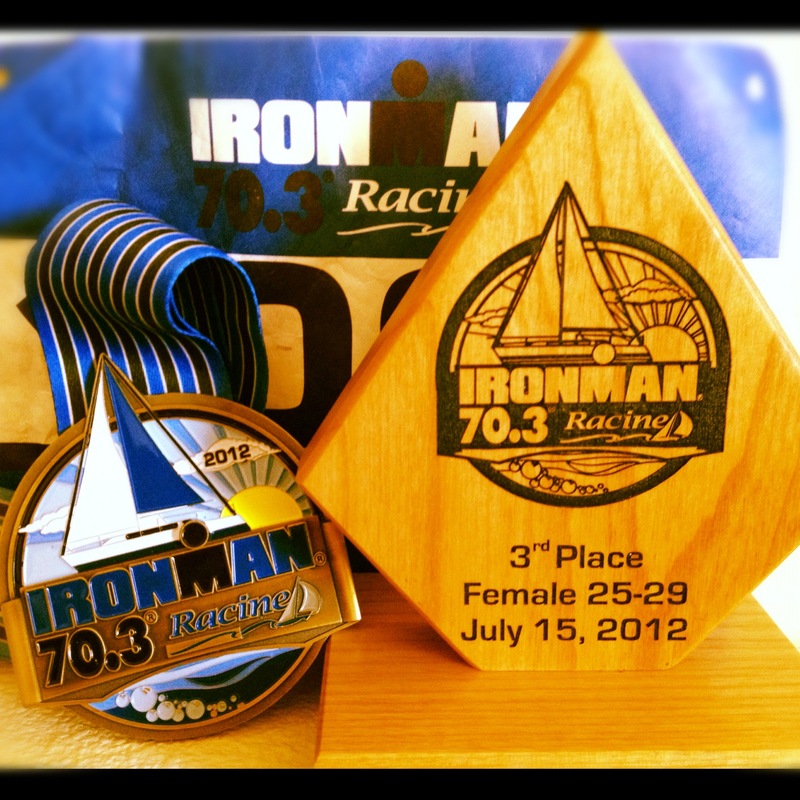 I placed 3rd in my age category, 16th Female overall (including the Pro’s) and 144 Overall. As it turns out, that girl in the purple top placed 1st in my age category. Valuable lesson learnt with regards to keeping focus and having the confidence to ride at a stronger pace if you feel you can! For my first 70.3 IM I am happy with this result as I really learned a lot and gained valuable experience which will help me in my next event. Subsequently, after waiting all day, I managed to gain a roll-down slot for the 70.3 IM World Champs, in Las Vegas 9th September 2012….so one week to recover then I can start preparing for that. I really could not have achieved this result or felt so calm and prepared without Coach Ken Bryson’s training plan, coaching, advice and support. Firstly, what an absolutely phenomenal performance! Inspiration, determination, guts, talent – it had it all. Secondly, those vital bits of experience that you mentioned having learned are so easily rectified in someone with your capabilities and compared to what you have already achieved that I certain if you were to race against that same field of competitors again, you would win your age category! I can’t wait to hear about Las Vegas on September 9th! Keep doing what you’re doing and you’ll nail it! !